Europe's financial services industry has been forced to embrace open banking and customer data sharing. Now, with PSD2, U.S. banks will soon have to follow suit or face increased online competition. Two significant changes to European Union regulations have given the FinTech industry a major shot in the arm and strengthened its position as a competitor to traditional banking, the result of which will be that U.S. banks will be forced to rethink their client strategies. Along with the EU's General Data Protection Regulation (GDPR), which gave citizens the right to control the use of personally identifiable information, the Payment Services Directive 2 (PSD2) required the sharing of consumer banking data with third parties when authorized by the customer. One result of the GDPR is that businesses will have access to honestly sourced data from consumers using a transparent opt-in model, which will be a rich source of information for discovering user patterns in large datasets, according to a recent report by Juniper Research. The purpose of PSD2, which was passed in 2015 with a two-year implementation deadline, was to regulate the emerging payment services industry and increase competition by allowing participation by non-banks, such as FinTech companies. Jonathan Chertkow, a partner and regulatory adviser in law firm Hogan Lovells' London office, said PSD2's data-sharing requirement won't necessarily take the core business away from banks — since customers will still have the underlying bank account. It could, however, take the primary customer relationship away from banks, since consumers will interact with online or mobile apps rather than the underlying institution. "In a worst case for the banks, they could become utility providers, providing the infrastructure for accounts and payments, with the third-party providers taking the front-end customer relationship," Chertkow said. "We are already seeing the U.K.'s open banking initiative, which is based on but wider than PSD2, being explored in other markets, including in Central America, Asia and Africa. So it wouldn't be surprising to see similar developments in the U.S.," he added. Even before being pressured by PSD2, some European banks were embracing emerging digital technologies, such as real-time electronic payments; they often gained the technology either through partnerships with FinTechs or by acquiring them outright. "U.K. banks are not, at this stage, seeing FinTechs so much as competitors as they are seeing them as potential collaborators with whom they can develop new journeys, services and products," Chertkow said. "What is clear is that consumer behaviors are changing, particularly with younger generations. Traditional banks need to decide whether they want to maintain their existing business model and seek to differentiate it from the FinTechs or whether they need to respond by copying the best user experiences of the FinTechs." For example, Spain-based BBVA, recognized by Forrester Research as having the best mobile banking app in the world, has been steadily gobbling up FinTechs over the past several years. In 2014, BBVA acquired U.S.-based Simple, an online bank founded in 2009 that has more than 100,000 customers. In 2016, BBVA bought Finnish online banking startup Holvi. Last year, BBVA snatched up Openpay, a Mexican startup that offers electronic payments for businesses. BBVA also acquired Madiva, a Spanish big data startup, and it has invested heavily in Germany-based solarisBank, another B2B financial services firm. Through its partnerships and acquisitions with FinTech, BBVA has been able to offer clients an augmented reality app for finding real estate, a blockchain-based loan system, and a new API platform used to connect customers to third-party consumer and B2B payments. BBVA also used AI-based robotic process automation combined with natural-language processing to build a chatbot for banking by voice. Before the bank even began its FinTech acquisition spree, BBVA's executive chairman, Francisco González, wrote in a 2013 Financial Times editorial, "Some bankers and analysts think that Google, Facebook, Amazon or the like will not fully enter a highly regulated, low-margin business such as banking." "I disagree," he wrote. "What is more, I think banks that are not prepared for such new competitors face certain death." 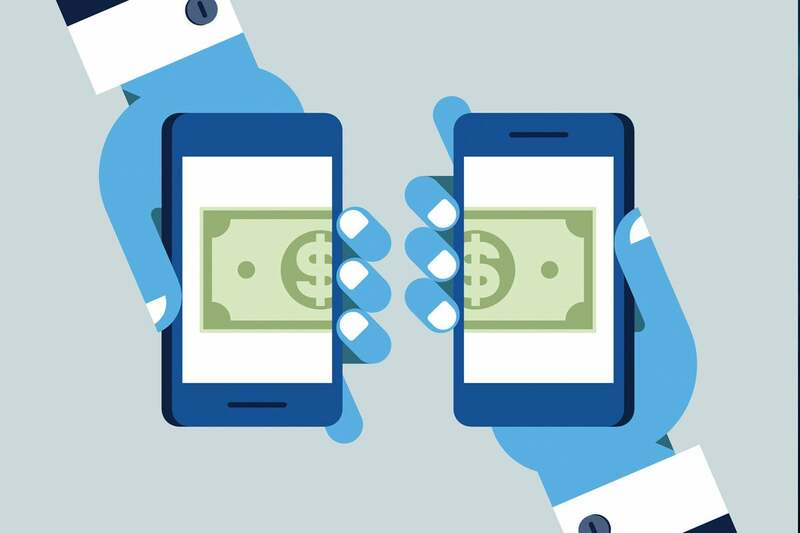 In fact, Google, Amazon, Facebook and Apple (GAFA), as well as Samsung, have all begun entering the financial services market, offering mobile banking and real-time payment apps. The Asian market's equivalent to GAFA is Baidu, Alibaba and Tencent (BAT), traditional tech companies gone FinTech. 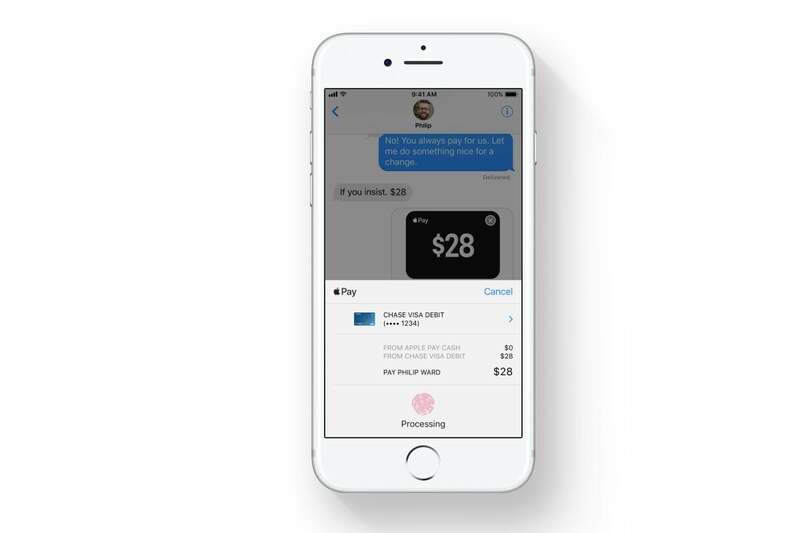 What Apple pay P2P payment messages will look like on iOS 11. "They're doing baby steps into the market," said Ignasi Barri Vilardell, who's in charge of digital business development and innovation at German-based banking IT consultancy GFT Technologies SE. "What's preventing [BAT] from going to the states and offering the same services? For sure, regulation will be one step needed, but eventually it's something that will happen. At that moment is when traditional banks will struggle to be competitive." 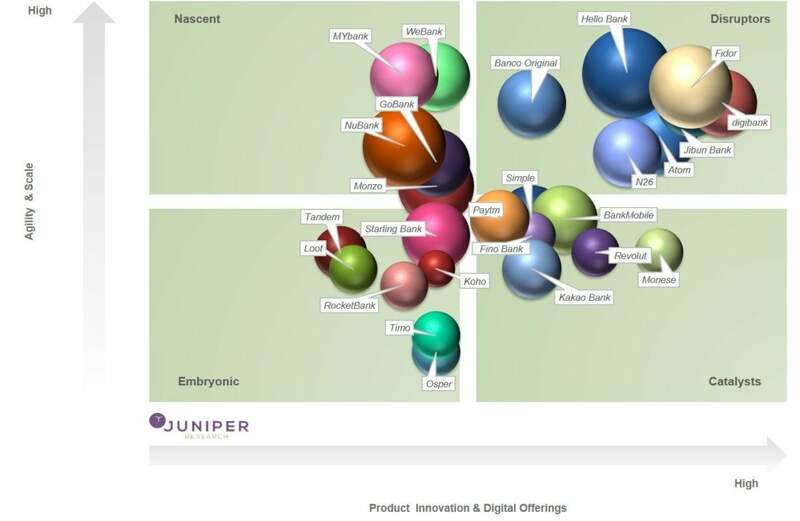 How advanced various European banks and FinTechs are in terms of product innovation and digital offerings. A 2017 survey of nearly 33,000 consumers in 18 countries conducted by consulting firm Accenture found broad consumer demand for automated services, or software powered by AI. The survey showed that 50% of Gen Y respondents in the U.S. would consider banking with Google or Amazon, and 71% would use entirely computer-generated support for banking services. For example, AI and big data have been used by U.K. banks to analyze consumer financial statements and help them make smarter decisions based on those insights, such as how much money customers spend on restaurants or what their average net income is after paying all their bills each month. Prior to the EU's new data privacy and open banking regulations, banks acted as if they knew exactly what their clients needed and didn't need to pay attention to other market segments; they no longer have that luxury. "Those ruling the markets today are digital companies; therefore, if they want to rule the financial services market, they need to become digital," Vilardell said. "It's a transition that requires time, investment, vision and change — and that's painful." Almost a decade ago, BBVA had already begun a digital transformation journey with a long-term strategy that included changing its core IT infrastructure to be more modular and creating a microservices architecture, building APIs and mobile banking applications. The bank also created a new company within the BBVA group, called BBVA Data, that Vilardell said allowed it to bypass outdated internal bureaucracies and more quickly explore what new services were possible from an open data perspective. "BBVA is now one of most advanced banks in the world," Vilardell said. Through its technology acquisitions, BBVA was able to offering hyper-personalized digital services for its clients, such as a budgeting application for when couples are having a baby or an application to help customers decide whether to buy or rent a home. Prior to its digital transformation strategy, BBVA, had been one of the worst banks in terms of online services, Vilardell said, but over the past three years, it has "leapfrogged all its competitors" both in Spain and globally. Should a customer's data belong to the bank? As a general trend, U.S. banks have fallen behind their European counterparts in adopting digital technology, Vilardill said, and they have remained protective of their customer data, refusing to share it with third parties that offer payment services. "This is different from what we have in Europe. In Europe, financial data belongs to the end customer and not the bank," Vilardell said. "The bank should help you out to integrate or interact with third parties. This is not happening in the States. They're not implementing concepts like open banking." Open banking refers not only to greater transparency for customers around how banks use their data, but also to the creation of APIs enabling third parties to build applications and services based on that data. For example, in 2015, the operator of South Korea's largest messaging app, Kakao, and KT Corp., the country's largest telco, formed KakaoBank, an internet bank based on their existing consumer relationships — the data from which they were able to roll into additional services. Previous to the bank's launch, Kakao had also partnered with 16 banks to launch a mobile wallet service for person-to-person payments. "They formed from a telco company with 2 million customers. In less than two weeks, they had more than 1 million customers [to whom they could] offer financial services," Vilardell said. A lot of FinTechs start in the payments or lending arena or by building out services such as credit scoring and cybersecurity for the banking industry, but eventually they will begin offering consumers core banking services such as savings accounts or mortgages, Vilardell said. While many believe the inclusion of third parties in financial services will lead to increased competition for legacy revenue streams, digital technology that places the client experience at the center of disruption will actually foster new and different revenue streams not previously considered, according to Sean Viergutz, Americas Financial Services Payments leader for EY (Ernst & Young). And, PSD2 has already begun affecting the U.S. banking industry by introducing the concept of broadening services to clients. "We see banks of all sizes embracing various models that share data with third parties to promote innovation, but in a controlled, strategic way that allows the U.S. institutions to test the waters before it is forced upon them by regulation," Viergutz said. In order to play catchup with their European and Asian counterparts, U.S. banks need to see the FinTech industry not as competition but as an opportunity to help them create a thoughtful collaboration strategy that aligns to an organization's purpose and strategy and ultimately improve the client's experience. Or eventually FinTechs will be acquired by banks, Vilardell said. A digital company is a company that can create value in existing or new areas through interoperability, openness and agility, Vilardell said. It is a company that weights what it does as much as how it does it. It is not only about business and technology; it is about how the organization works as a whole (without silos) with harmony to embrace change and learn continuously. One of the first digital banks, FidorBank, which originated in Germany, started as a social community to exchange information and opinions on financial products and financial advisers; it evolved into an "anytime, anywhere and hyper-personalized" bank by applying emerging digital technologies and consumer-centric principals, Vilardell said. FidorBank started as a social community to exchange information and opinions on financial products and financial advisers; it evolved into an "anytime, anywhere and hyper-personalized" bank by applying emerging digital technologies and consumer-centric principals. 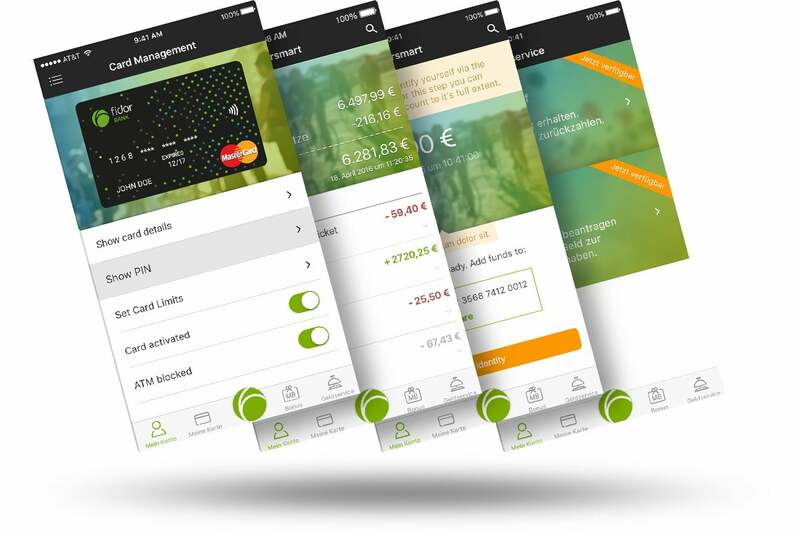 While licensed as a bank in Germany, FidorBank also sells its open banking digital platform fidorOS, which has a fully integrated front-end layer, API layer, banking modules and core functions, to various financial services and non-financial services customers, enabling them to build a digital banking system. For example, FidorBank partnered with German telecom provider Telefónica O2 to build a digital bank in only eight months atop its fidorOS platform. FidorOS banking modules include a core customer account, payment and data management and onboarding functions, as well as features such as customer engagement through a community forum and customer intelligence through advanced analytics. U.S. financial services have begun embracing blockchain, advanced analytics and AI for operational efficiency. For example, last year JPMorgan Chase & Co. began implementing its COIN (contract intelligence) machine-learning system, which runs on a private cloud and is aimed at decreasing mistakes and increasing efficiency in processing legal documents and contracts. In fact, the five largest U.S. banks are investing heavily in deploying AI and machine learning to create more efficient services, according to a report. "Based on what I see in Germany, Italy and Switzeralnd, U.S. banks are not that far behind," Vilardell said. "The problem I see with U.S. banks compared with European banks is the end customers are not seeing banks investing ... money in improving customer experience. U.S. banks are taking their customer base for granted." If banks do not evolve to be more modular in their IT deployments and more focused on the customer experience, they will struggle with FinTech competitors that will eat a part of their market share in concrete arenas, such as mortgages, online payments or lending. Vilardell's advice to U.S. banks: don't wait for regulators to mandate an open business model, and embrace the concept of becoming a digital company, which doesn't necessarily mean being technology-driven. "It means having a digital culture, which is related to how you release products and how you work internally — not siloed but collaboratively — working across different departments," he said. "And, at the end of the day, it's about how open you are to learning from other segments, other industries and other companies."